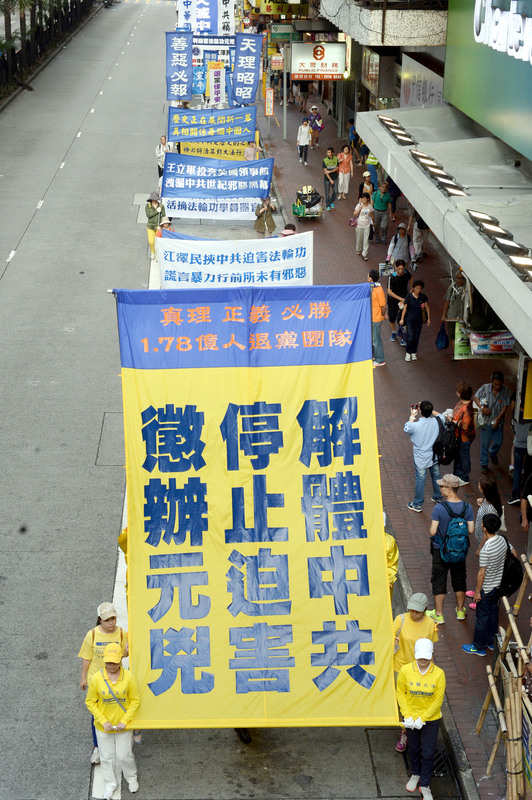 Falun Gong practitioners held a rally and a march, their signature forms of nonviolent resistance, in the midst of pro-democracy protests on Hong Kong Island. 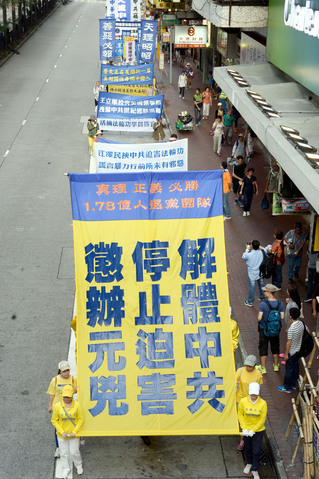 On October 1, the 65th anniversary of the Chinese Communist Party (CCP)'s takeover of China, practitioners protested the brutal persecution of Falun Gong by the Communist regime. 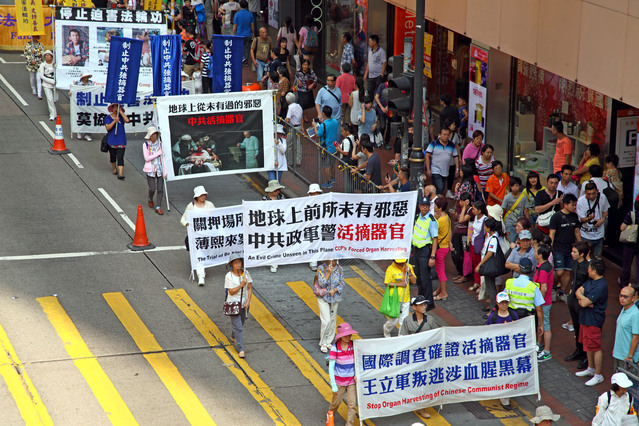 Hong Kong Falun Gong spokesperson Kan Hung-Cheung stated that Chief Executive Leung Chun-ying is the Communist regime's representative in carrying out the persecution of Falun Gong in Hong Kong. He stressed that the only way out for a better future for Hong Kongers is to uphold justice, disintegrate the CCP, and end the persecution. He also expressed his support of citizens' peaceful efforts to protect Hong Kong's core values. He thanked Hong Kongers for their long-term support of Falun Gong and said that practitioners would continue supporting Hong Kongers' saying “no” to the CCP. His speech won warm applause from locals. 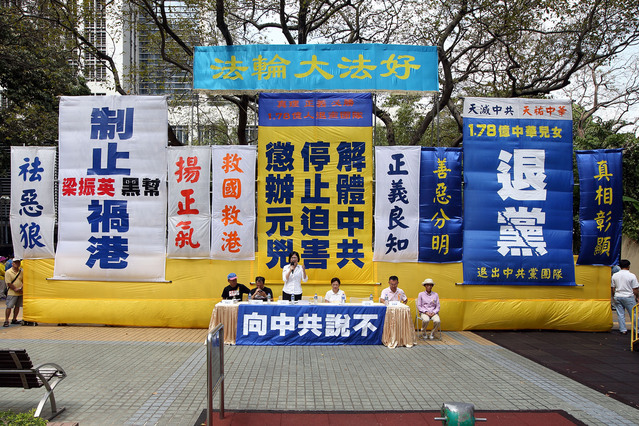 The rally was held at the King's Road Playground at North Point on Hong Kong Island. The march embarked from there and ended at the Chinese regime's Liaison Office in Sai Wan. 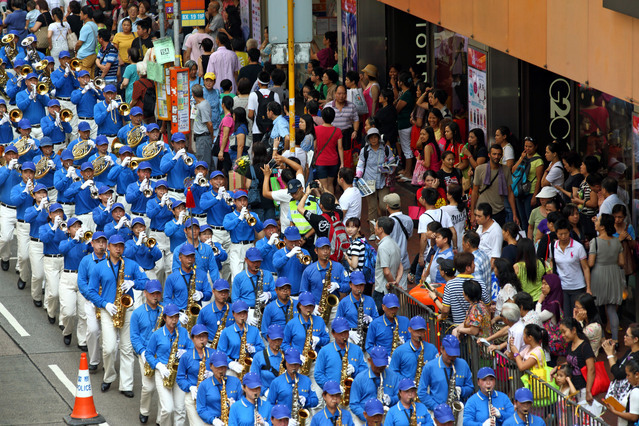 Many locals watched the procession, and some mainland tourists expressed their support. 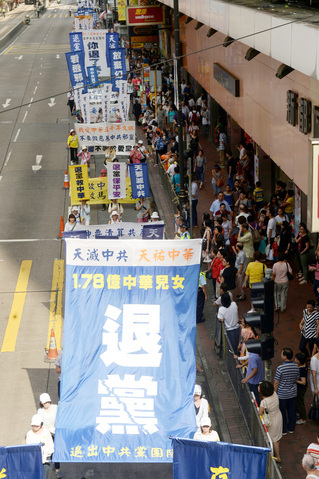 As practitioners passed several pro-democracy protest gathering areas in Causeway Bay, Admiralty and Central, students shouted “Falun Dafa is good” to members of the march. Several public figures spoke at the rally and praised Falun Gong practitioners' fifteen-year-long peaceful resistance to the persecution. 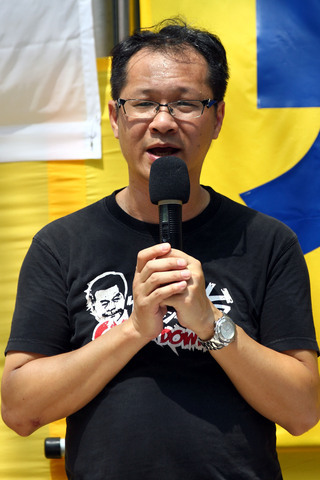 Speakers included Vice Chairman of the Democratic Party Richard Tsoi, Taiwan Falun Gong Human Rights Lawyers Organization spokesperson Theresa Chu, former legislator Fung Chi-wood, and democratic activist Lam Tsz-kin. Mainland pro-democracy activists Hu Jia, Zhu Xinxin and Bao Tong also spoke via audio recordings and encouraged rally attendees to terminate their memberships in organizations affiliated with the CCP.